On February 17th, 2013 Rita left Uganda with her aunt, Linate, headed for Aswan Health Centre in Egypt. A week later Sir Magdi Yacoub performed heart surgery on Rita and he was able to repair, rather than replace, the damaged valves. As Chain of Hope covered the cost of the flights and the operation some of the funds we raised were spent on a monitoring machine for Kabale Hospital and for 2 years of follow up appointments and medicine. 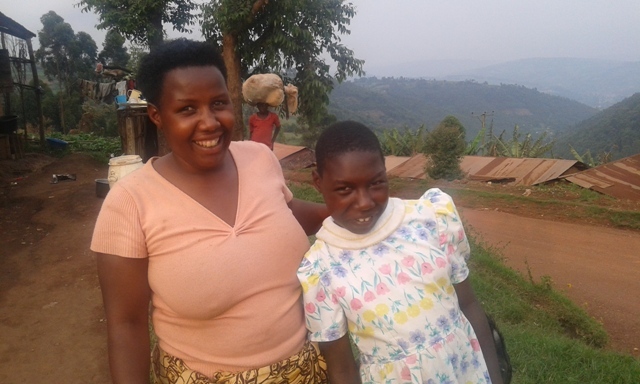 Over the last 2 years Rita and her mother have travelled to Kampala every 3 months for her follow up examinations and treatment and we are happy to report that she has made amazing progress and has been back at school now for over a year. In December I attended a Chain of Hope Carol Concert in London and had the opportunity to thank Sir Magdi personally. I will be sending this lovely photograph of Rita and her mother to Chain of Hope and maybe can persuade them to send a team to visit our clinic on Bwama Island one day!